November 30, 2009  Under President Luiz Inacio Lula da Silva, Brazil's economy has surged. His adherence to globalization helped create jobs, and his far-reaching social programs have lowered poverty. Brazilians are more optimistic than ever of breaking the cycle of poverty and inequality that long marked Latin America's biggest country. November 26, 2009  When Ayon committed suicide in 1999, she was just 32 years old — and already a star in the Cuban art world. A major exhibit of her work now under way in Havana has revived an enduring mystery in Cuba — about art, African myths and the shadowy, all-male secret society known as Abakua. November 23, 2009  The United Nations High Commission for Refugees reports an increase in asylum seekers from several African countries to South America. Among countries seeing a spike in asylum seekers from Africa are Brazil and Argentina. Guest host Jennifer Ludden discusses the trend with journalist Anil Mundra, who has reported on African immigration to Argentina. Mundra is joined by Professor Clarence Lusane, of American University. Lusane works closely with African rights organizations in Brazil. November 20, 2009  Brazil's ghettos are poverty stricken and violent. 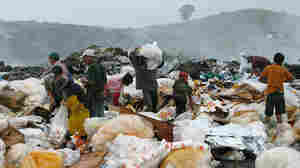 But there are people fighting against the odds to turn things around for the poor children of Rio de Janeiro. Among them is an unusual apostle: a Rio socialite who founded a school for slum-dwelling children and views education as an equalizer. 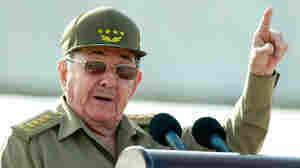 November 18, 2009  Cuban leader Raul Castro has maintained an abusive system that his brother put in place to repress dissent, according to Human Rights Watch. The report also calls for a change in U.S. policy, lifting the longtime trade embargo in favor of more targeted sanctions. November 18, 2009  Argentina's government has nationalized the television contract that the country's soccer league had with cable television. The president's decision delighted millions of Argentine fans, who previously were excluded from the TV audience because they couldn't afford the cable fees. Now they're watching games for free. 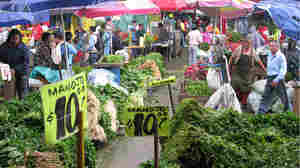 November 10, 2009  Cuba's state-run economy has been in crisis mode for years, but it now faces some especially sobering arithmetic. 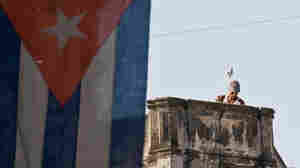 With trade falling and debt stacking up, President Raul Castro has warned Cubans that the island's socialist system must change. And he's asking them for something they're not used to giving in public: criticism. October 27, 2009  Rep. Luis Gutierrez, a Democrat from Illinois, wants to bump immigration to the top of the President's agenda. But is it realistic for the House and Senate to take up immigration reform next year? Ruben Navarrette, a syndicated columnist for CNN.com, explains why he thinks Guitierrez's timeline is unrealistic. October 27, 2009  President Obama says he wants to change United States immigration policy. But so far, immigration has taken a backseat to other pressing issues, like health care, the economic recession and the ongoing conflicts in Afghanistan and Iraq. But Rep. Luis Gutierrez, a Democrat from Illinois, wants to bump immigration to the top of the President's agenda. Gutierrez explains why he thinks comprehensive immigration reform cannot wait any longer.